There were a whole lot of new faces last week. WELCOME! 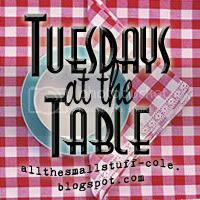 I've had a few thoughts about "theme weeks" - favorite dessert, best crock pot dinner, etc. But, I don't want to limit you. What do you think? Do you prefer sharing the new recipe that you have on tap? Or would the occasional "theme week" liven things up? Let me know you're thoughts! In an ungreased 2 quart casserole, gradually stir milk into soup. Stir in ham, macaroni, mushrooms, pimiento and onion. Bake, covered about 40 minutes at 375 (until macaroni is tender). Uncover, sprinkle with cheese and bake uncovered for about 10 minutes (until cheese melts). Oh, this looks like a nice and easy meal! I'm going to try it! thanks! What a great way to use up the end pieces of a Sunday ham! Thanks for the chance at linking up every week! I prefer a general link-up, with maybe a themed link-up once a month or seasonally. That sounds like a great make ahead meal. Thanks for hosting! I like the idea of specific weeks. Not that I really participate too often being that I don't cook that often ... but I LOVE the idea of meals for 1 or 2, frozen meals, crockpot meals, etc. Mainly, I selfishly like these because I NEED to cook more! Okay ... and it is Monday night still? And all these people have already posted? Look at you, Cole! You're a blogging genius/success/ah you know what I'm getting at! I love it! It can even be made into a vegetarian meal without the ham, right? Thanks! This sounds interesting. I made a ham loaf with my leftovers. I'll have to try this next. I like the idea of themed weeks too once or twice a month. Oh yeah, anything with condensed cream soup has got to be good! Num yummy! I am not a pork eater but I bet it is yummy.. I made something yummy this week. If you did a theme it would be fun but like April said, to announce a week before.. Have a great day. my husband would love it!!! this sounds like my kind of receipe! Looks like a great recipe...and I just happen to have some ham that needs to be used!! Themd weeks would be great!